Awesome issue of Haunt of Fear #15. Features the an awesome skeleton zombie cover! A true precode horror classic! Nice Cream to Off-White pages. Perfect to add to your collection! Message or call with any questions or offers (as not too sure how to price it). 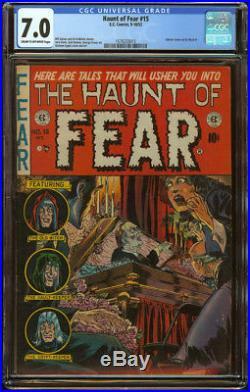 The item "Haunt of Fear #15 CGC 7.0 C/OW Pgs Skeleton Zombie Cover Precode Horror GA Book" is in sale since Sunday, July 1, 2018. 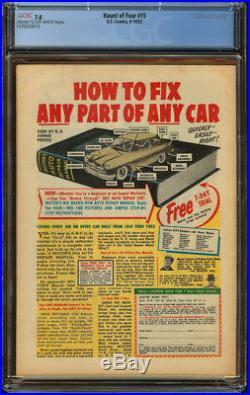 This item is in the category "Collectibles\Comics\Golden Age (1938-55)\Horror & Sci-Fi". The seller is "columbiacomics" and is located in Columbia, South Carolina. This item can be shipped to United States, Canada, United Kingdom, Denmark, Romania, Slovakia, Bulgaria, Czech republic, Finland, Hungary, Latvia, Lithuania, Malta, Estonia, Australia, Greece, Portugal, Cyprus, Slovenia, Japan, China, Sweden, South Korea, Indonesia, Taiwan, South africa, Thailand, Belgium, France, Hong Kong, Ireland, Netherlands, Poland, Spain, Italy, Germany, Austria, Israel, Mexico, New Zealand, Singapore, Switzerland, Norway, Saudi arabia, Ukraine, United arab emirates, Qatar, Kuwait, Bahrain, Croatia, Malaysia, Brazil, Chile, Colombia, Costa rica, Panama, Trinidad and tobago, Guatemala, Honduras, Jamaica.